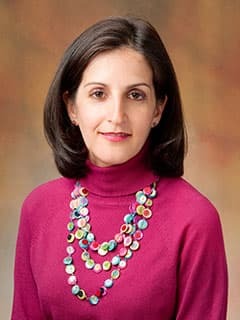 Led by Sogol Mostoufi-Moab, MD, researchers in the Mostoufui-Moab Research Program are studying the long term late effects of hematopoietic stem transplantation (HSCT) on pediatric patients with benign and malignant hematologic disorders. Previous studies in the Mostoufi-Moab program showed that allogeneic hematopoietic stem-cell transplantation (alloHSCT) survivors treated with total body irradiation (TBI) exhibit bone deficits and excess adiposity which can contribute to long term late treatment effects such as impaired glucose metabolism and increased risk of insulin resistance. Premature epiphyseal closure of the lower extremities contributing to short stature after cis-retinoic acid therapy in medulloblastoma: A case report. Hormone Res Paediatr, October 13, 2015. Noyes JJ, Levine MA, Mostoufi-Moab S.
Insulin-like growth Factor-1 and adiponectin and associations with muscle deficits, disease characteristics, and treatments in rheumatoid arthritis. J Rheumatol. 2015 Nov;42(11):2038-45. Baker JF, Von Feldt JM, Mostoufi-Moab S, Kim W, Taratuta E, Leonard MB. Kovatch KJ, Bauer AJ, Isaacoff EJ, Prickett KK, Adzick NS, Kazahaya K, Sullivan LM, Mostoufi-Moab S.